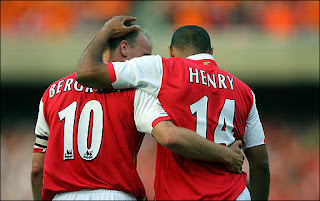 Neither Bergkamp or Henry could be described as orthodox strikers; originally a winger, Henry tookÂ position out towards the left, coming inside on his favoured right foot, while Bergkamp played in a withdrawn role. Both were blessed with sublime skill and complimented each other brilliantly, Bergkamp’s lack of a killer instinct and pace was irrelevant with Henry’s finishing ability and pace and allowed him a perfect environment to create. They scored 31 goals between them in 2001/02 to clinch the title for Arsenal and were instrumental in the Invincibles side a two years later. Together for little over a year, Dagger and the Animal were the lethal tip of the Dream Team and their exit signalled the end of an era for Barcelona. Stoichkov had excellent physique and technique but what made the Bulgarian stand out at Barcelona was a nasty streak in a team with “too many nice guys” according to Cruyff. In his first El Clasico, he was sent off for stamping on the ref, earning him a two-month ban, and was sent off after 6 minutes against Rayo Vallecano. Romario was different; possessing impeccable control in tight spaces and a near-unmatchable finishing ability, but was an introvert to Stoichkov’s passionate embodiment of the people of Catalonia. After initial issues, they were incredible. They scored over 50 goals between them in 1993-94 and were key parts in some of the greatest games in Barcelona’s illustrious history, including a 5-0 win over Real Madrid. But it was over almost as soon as it had begun, Romario was a womaniser and regularly turned up for training late and Cruyff’s rotation policy and public snipings at the players were wearing thin. After starring at the 1994 World Cup, things had changed. By the end of the 1994-95 season, Barcelona had finished 4th and both had left. Tasked with replacing the brilliant Keegan/Toshack partnership, a pair so telepathic they successfully beamed mental images of shapes to one another (Keegan later admitted he could see through the cards), they managed to surpass them. Everything clicked into place for the pair during a Merseyside derby in 1981, Ray Kennedy suffered an injury and was replaced by David Johnson with Dalglish moving back into midfield. Dalgish began to pull the strings, scoring two and setting up another for Rush, a new signing from Chester City, in a 3-1 win. From then on, Dalglish played in the hole behind Rush, threading passes to the agile young striker. Rush scored 30 in his first season, 31 in 82-83 and 47 in 83-84 when the pair scored a combined 59. Many will think of the Galacticos primarily as a commercial scheme – perhaps they are right – but Florentino Perez is only following what made Real Madrid such a successful club. In 1953, Santiago Bernabeu formed a policy of buying the best players from abroad and it brought them great success winning 6 European Cups under his presidency. Among those foreigners were Argentinian Di Stefano and Hungarian Puskas, who scored close to 500 goals between them for Madrid. There’s not really much more that needs to be said here, they’re two of the greatest players to have played the sport, however the 1960 European Cup final against Eintracht Frankfurt is worth a look. Seeing them now you’d wonder why, but at the turn of the century the Spaniards were one of the world’s most fearsome striking duos. Morientes joined Real Madrid as a 21 year-old on the back of some impressive performances for Zaragoza, in which he scored 30 goals in 2 seasons, but was expecting to act as a reserve behind Davor Sukor and Predag Mijatovic. Instead he was first choice along with Raul and formed a partnership that ensured he never scored less than 10 goals in a season and won them 3 Champions Leagues. The arrival of Ronaldo was the beginning of the end for the pair, Morientes was dropped from the first team, first moving on loan to Monaco in the 2003-04 season, where he performed excellently, particularly in their run to the Champions League final, and then to Liverpool in 2005 after any hope of a first team place at Real was blocked by the arrival of Michael Owen. Since then he’s disappointed at each club he’s been at, only scoring more than 10 goals in his first season in Valencia. Meanwhile Real’s talisman Raul has suffered too; only coming close to his old performances in two recent seasons and was dropped from the Spanish national team at the age of 29 when he should should still be in his prime. I am wondering what if teams played a 4-3-3? Would Ronaldinho-Eto’o-Giuly feature on your top 5? I think that was one of most fearsome striking force ever. It wasn’t intended as a top 5, just a list of great ones, I think attempting a top 5 might melt my brain. May well do another on threes. That Barca three would definitely be up there, as would Gre-No-Li.